In The Little Book, Joel Greenblatt, Founder and Managing Partner at Gotham Capital (with average annualized returns of 40% for over 20 years), does more than simply set out the basic principles for successful stock market investing. He provides a "magic formula" that is easy to use and makes buying good companies at bargain prices automatic. Though the formula has been extensively tested and is a breakthrough in the academic and professional world, Greenblatt explains it using 6th grade math, plain language and humor. You'll learn how to use this low risk method to beat the market and professional managers by a wide margin. You'll also learn how to view the stock market, why success eludes almost all individual and professional investors, and why the formula will continue to work even after everyone "knows" it. JOEL GREENBLATT is the founder and a managing partner of Gotham Capital, a private investment partnership that has achieved 40% annualized returns since its inception in 1985. He is a professor on the adjunct faculty of Columbia Business School, the former chairman of the board of a Fortune 500 company, the cofounder of ValueInvestorsClub.com, and the author of You Can Be a Stock Market Genius. Greenblatt holds a BS and an MBA from the Wharton School. There's certainly no dearth of advice on investment. The best-seller lists are full of books on how to be a successful investor "in only 15 minutes a week", on how to become an "automatic" millionaire, and about how to invest if you're "young, fabulous and broke". 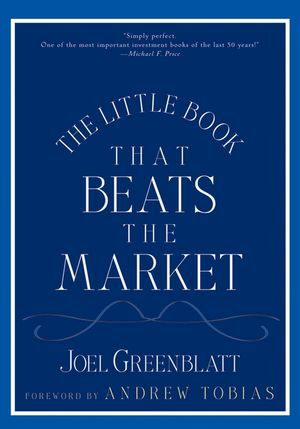 The best book on the subject in years is value investor Joel Greenblatt's The Little Book That Beats the Market, which is still a top seller months after its release. Beyond the credibility that comes from someone whose private investment partnership, Gotham Capital, has produced 40 per cent a year returns over the past 20 years, Mr Greenblatt brings an elegant and simple writing style to what can be a complicated subject. He outlines a "magic formula", based on how he invests, that anyone can use. The formula has only two inputs, a company's earnings yield and its return on capital. The rationale is straightforward: buy shares in good businesses, measured by returns on capital, only when they're available at bargain prices, defined as a high earnings yield. The magic formula looks for companies that have the best combination of earnings yield and return on capital, with each input weighed equally. An outstanding company with an expensive stock ranked, say, first for return on capital but 1,999th on earnings yield, would have the same combined ranking of 2,000 as a low return on capital company within expensively priced shares, ranking 1,999th in return on capital but first on earnings yield. Using this approach to create a regularly updated portfolio of about 30 stocks with the highest combined rankings, Mr Greenblatt tested his formula between 1988 and 2004. The results were remarkable: with only one down year, the magic portfolio would have returned 30.8 per cent a year, against a 12.4 percent annual return for the S&P 500. Rather than using the latest 12 months' earnings to calculate earnings yield and return on capital, Mr Greenblatt and his analysts try to improve on the rote application of this formula by using earnings estimates in a "normal" year, one in which nothing unusual is happening within the company, its industry or the overall economy. Mr Greenblatt has created a free website for screening stocks based on his approach (www.magicformulainvesting.com). In a recent screen I carried out on the site of the top 100 magic formula companies with market capitalizations above Dollars 2bn, the top 10companies ranked by market cap were Exxon Mobil (XOM), Microsoft (MSFT), Pfizer (PFE), Johnson & Johnson (JNJ), IBM (IBM), Intel (INTC), Conoco Phillips (COP), Dell (DELL), 3M (MMM) and Motorola (MOT). Now that's an impressive group of companies. I own one of them(Microsoft) in my portfolio. Given how sceptical I am about the tech sector, owning this is a real leap for me but this is a fantastic business and the stock is attractively priced. Microsoft has a dominant franchise, some of the most jaw-dropping economic characteristics ever achieved, capable, honest, shareholder-friendly management, and unlike most technology companies, reasonably predictable future prospects. I am optimistic about Microsoft's future prospects for a number of reasons. The company will be releasing in the next year significant upgrades of its two cash cows, Windows and Office. Historically, these events have been big and highly profitable events for Microsoft. Yes, Microsoft's days of ultra-high growth are over, inevitable for a company with Dollars 40bn in annual revenues. But it is highly likely the company will grow substantially faster than the S&P 500 for many years to come and that its fabulous economic characteristics will remain largely intact. At a recent price of Dollars 27, Microsoft, after adjusting for the company's cash hoard, is trading at under 17 times earnings estimates for this calendar year. I don't claim this is screaming cheap but it is close to the lowest p/e multiple the stock has ever traded at and is, I believe, an attractive price for a company of its quality and bright future. You might wonder if Mr Greenblatt is concerned that popularising his strategy will mean it will stop working. "Traditional value investing strategies have worked for years and years and everyone's known about them," he says. "They continue to work because it is hard for people to do, for two main reasons. First, the companies that show up on the screens can be scary and not doing so well, so people find them difficult to buy. Joel Greenblatt's The Little Book That Beats the Market is pitched not to the swells of Wall Street but to the novice individual investor. Greenblatt, the founder of hedge fund firm Gotham Capital, has taken what he has learned about investing and written this skinny, pocket-size book. His goal: to explain how to make money in terms that even his five kids could understand. "I figured if I could teach them how to make money for themselves, then I would be giving them a great gift." Greenblatt, a Columbia Business School professor and an investor for 25 years, says, "I believe I can teach you (and each of my children) to be one of them" — meaning, a successful investor. The Little Book That Beats the Market is simple and sincere; Andrew Tobias, author of The Only Investment Guide You'll Ever Need, writes the introduction. The formula works if you have faith and are patient enough to follow his guidance — over time, Greenblatt says. Greenblatt's formula is based on Warren Buffett's investment principles: Invest in good companies when they are cheap. According to Greenblatt, his formula historically has beaten the market for nearly two decades. Although he does not name the stocks, he claims that from 1988 through 2004, the high-return/low-price stocks of 30 of the largest 2,500 companies had returns of 22.9% annually. Simple enough. But how do you find these stocks? "The truth is you don't need an MBA to beat the market," he writes. But there's no fairy godmother on Wall Street. "If your stockbroker is like the vast majority, he or she has no idea how to help you! They don't get paid to make you money. The plain fact is you are on your own." That said, you have no business investing in individual stocks on your own, he says. His magic formula promise: "If you just stick to buying good companies (ones that have a high return on capital) and to buying those companies only at bargain prices (at prices that give you a high earnings yield), you can achieve investment returns that beat the pants off even the best investment professionals." He has a free (for now) website, www.magicformulainvesting.com, which screens companies using his criteria. He advises individual investors to buy a basket of 20 or 30 top stocks over the course of a year and turn them over on a strict schedule, depending on how they perform. He does not mention a minimum amount to invest. Be forewarned, though. The formula may or may not work over "shorter" periods, which can often mean years, not days or months. Good things come to those who wait and, in this case, Greenblatt means that it takes three, four or even five years to show its stuff. After a year or two of performing worse than the market averages, most people won't stick with it. But you've got to "really believe in it deep down in your bones." Even if you don't drink the Kool-Aid, you will learn about the technique of value investing from a pro. Greenblatt boils investment jargon down to what you need to know as succinctly and humorously as possible. Along the way — and it won't take you more than two hours tops — you're given a tutorial on bonds, stock shares and prices, earnings yields, return on capital and more. The appendix, which is "not required reading," adds a more detailed, strategic commentary.